As a preferred partner of some of the major multiplex chains and single screen cinemas, we help you reach where you want to be. 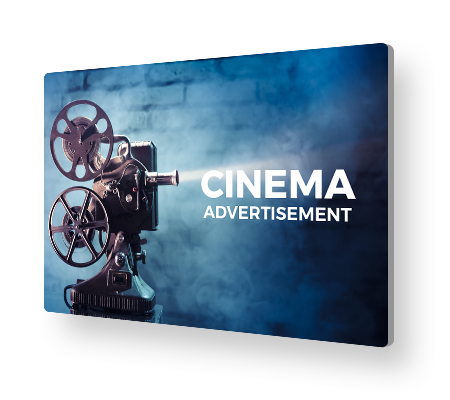 We help you maximize your ROI by enabling you to tap into all the benefits that Cinema Advertising can offer. Through our extensive network and dedicated support teams, we ensure 100% smooth execution of your cinema advertising campaigns. Based on different variables such as target geography, campaign length and cinema theatre, we come up with innovative techniques to promote your products and services in the theatres. Our focus is always on how to create the best impact in the minds of your target audience, when it comes to Cinema Advertising. We try our best to understand your unique business needs and come up with the perfect mix of on-screen and off-screen plans to achieve your objectives. We offer bookings for ten to twenty second on-screen slides (with or without audio) at various major multiplexes and single-screen cinemas of Mumbai and Bangalore. Your brand name would be displayed three to five times a day, before the start of the movie and during the interval, for maximum impact. We bring your brand to the spotlight by putting up on-screen Ad films that highlight your brand through larger than life visuals. There are slots from 10 to 60 seconds that are allotted across all regular shows. With no chances of audience distraction, we make sure your brand gets maximum mileage. We help your brand get maximum visibility through strategic placements of your hoardings, standees, posters, window clings, floor graphics and plasma lobby screens. While connecting you with your target audience, these in-lobby signage help you keep them informed about your latest news at all times. We help you place your products directly in the hands of your customers through well-targeted sampling campaigns. Apart from samples, flyers, coupons and mini-applications can also be distributed to enhance the brand experience of your audience, while increasing the chances of sales. Through our innovative, out-of-the-box thinking, we can come up with unique ways of helping you connect with your target audience. You can choose from various options such as ticket jackets, seat jackets, popcorn bags or buckets, kiddie packs or soda cups in order to establish your brand presence.